A core part of the Livestock Research Group’s capability building programme supports countries to develop advanced national greenhouse gas inventories for livestock emissions. Livestock development and climate change outcomes can support each other. More productive and efficient farm systems generally produce food at much lower greenhouse gas emissions per unit of product. However, many countries use simple (Tier 1) methods for estimating livestock emissions in their greenhouse gas inventories. Tier 1 methods are unable to capture the reductions in emissions intensity that result from improvements to livestock productivity and changes in farming practices. Can help facilitate climate-friendly branding and market access for livestock products. 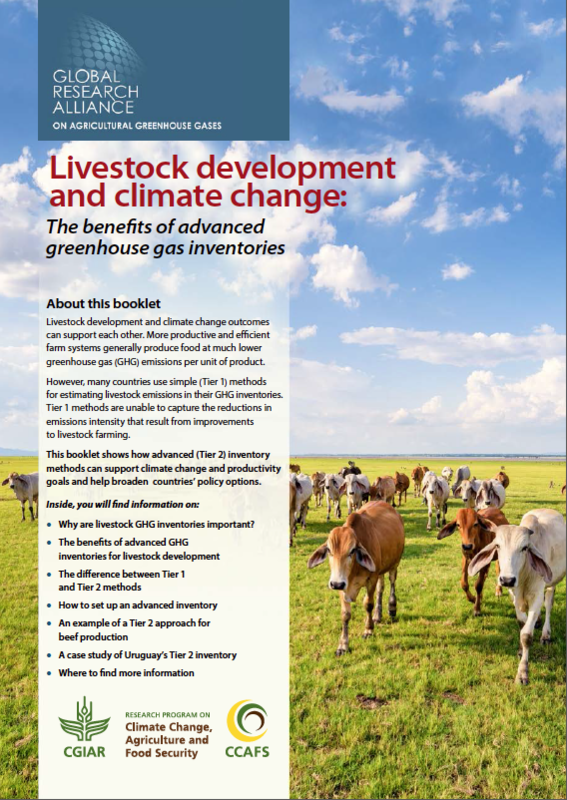 The Livestock Research Group partnered with CCAFS (the CGIAR’s Research Program on Climate Change, Agriculture and Food Security) to publish a guide on advanced inventories for livestock greenhouse gases. This provides helpful information on the differences between Tier 1 and 2 methods, why the latter are important for livestock emissions, and how to set up an advanced inventory. Our programme supports countries to develop credible and defensible Tier 2 inventories for livestock emissions that don’t place unrealistic demands on data sources. We work in partnership with countries to understand their livestock systems and to demonstrate how advanced inventories could support their wider policy objectives. We develop targeted training that helps them achieve their goals for an advanced inventory. This ranges from inventory design that works with existing data sets, to collection of new data, to technical training for country-specific emission measurements that supports development of country and feed-specific emission factors. The Livestock Research Group delivers inventory support in South and South East Asia, Latin America and the Caribbean, and Africa (see our Regional Activities page). We also have a related area of capability building work underway on measuring, reporting and verifying (MRV) livestock greenhouse gas emissions. All of our programmes are delivered in close collaboration with key partners, in particular CCAFS and the FAO.